“If you like cats, this is the place to go,” Earl said as we were leaving Great Cats World Park in August. A week ago, he was still telling one of his friends about this attraction. It was one of his favorites on our whole trip. We spent several hours in Cave Junction, on a tour of this park, visiting many of the 45 cats and 17 species they house. 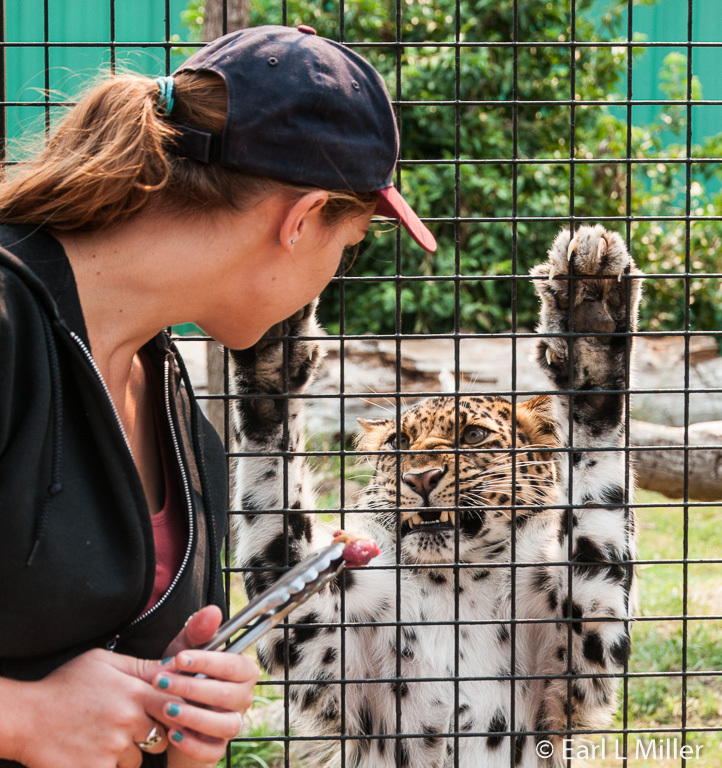 It’s a place where the animals have huge cages with plenty of space to roam, and tour guides provide a full understanding of these Great Cats. Craig Wagner began raising the animals while living in Minnesota 32 years ago. Big cats were his passion, and over a seven-year period, he trained himself and his cats for public shows. In 1998, he brought them to Wildlife Safari in Winston and performed his Predators in Action show during the summers. He chose Cave Junction in 2005 as the site to open his own park, which he is still developing. “Eventually we’ll have 70 different cats of 28 different species,” Wagner said. Wagner is a celebrity in his line of work. He did segments with the Crocodile Hunter and trained cats for Siegfried and Roy in Las Vegas. He has also been on the Letterman Show, Conan O’Brien, and Newton’s Apple. He has worked with Glenn Close and Peter Mathiason. 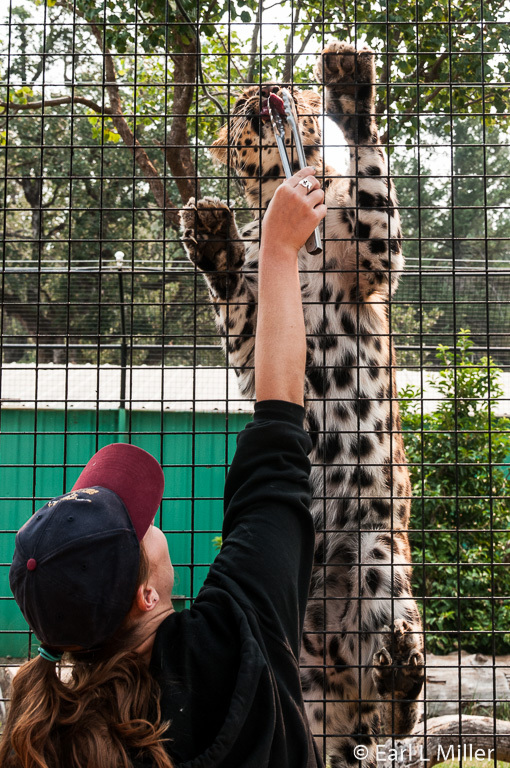 In 2000, he trained two snow leopards for the movie, “Vertical Limit” by Columbia Pictures. His cats are famous, too. Of cats seen in magazines, calendars, books, print art and posters worldwide, 60 to 70 percent are his. Ocelots, fishing cats, Amur leopards, and big tigers have been photographed. The park’s photographic focus has been on still shots and on natural behaviors. 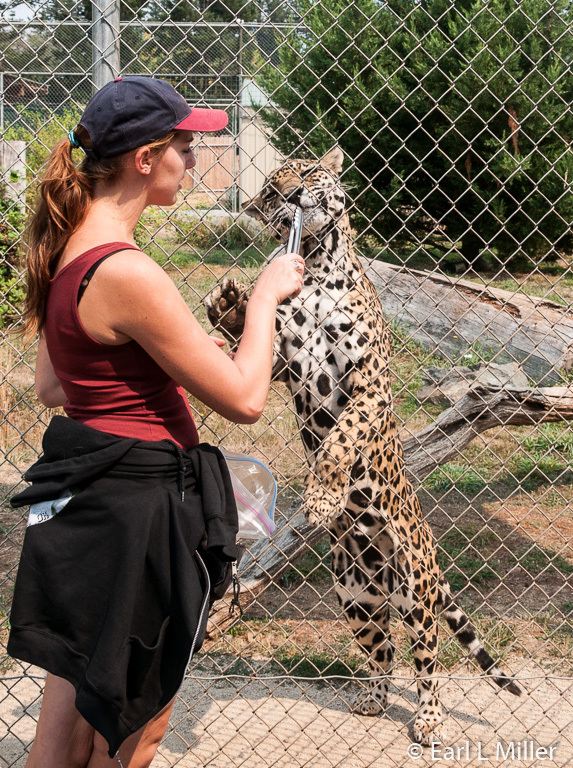 Great Cats touts Meiki, an Amur leopard, as the most photographed cat in the world. Meiki had his own line of bedspreads, wall hangings, floor mats, posters, and more. He was on the cover of National Geographic magazine. Unfortunately, Meiki passed away. But you can still see his picture on the billboard at the park’s entrance. We found sitting on the benches and listening to the stories on the cats and breeds quite enjoyable. The 1-1/2 to two hour tours leave regularly, so no waiting or appointments are necessary to take them. Kelsey, our guide, had these cats illustrate various natural behaviors. What they do depends on the size of the cat. We saw their lion roaring, a Bengal tiger playing with toys, and Amur leopards climbing on fences. 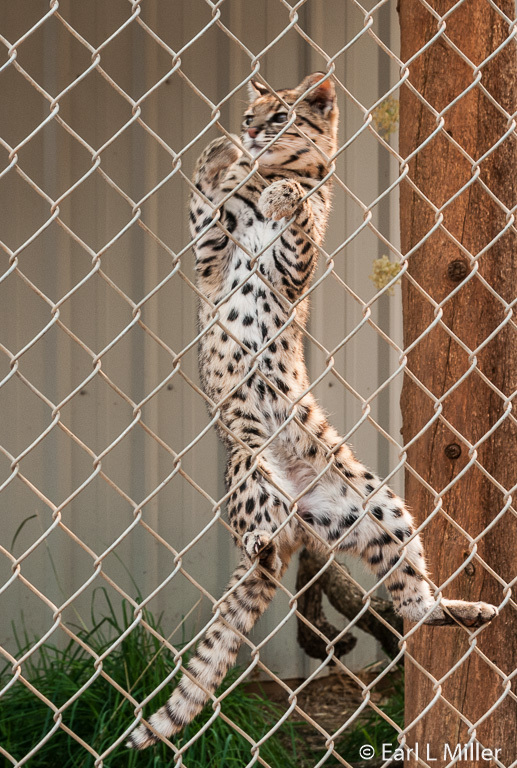 Not all of the cats were on view since some of them go off site for demonstrations such as the servals, fishing cats, leopards, and Geoffroy cats. The species you see depends on what is at the park that day. But we probably saw about 20 cats. Scooby is a Royal White Bengal tiger. He is used for breeding and has had two litters or two cubs each. He has been at the park since the age of two months, was 1-1/2 when first bred, and is now four. He eats beef, chicken, fish, and rabbits. Royal White Bengal tigers have been extinct in the wilds since 1951. 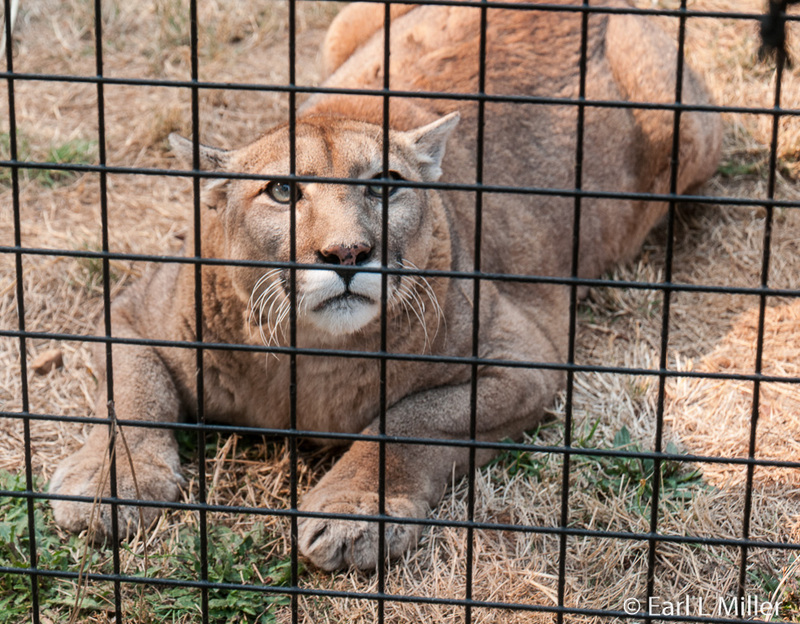 Tika is an eighteen-year-old cougar, also known as a puma or mountain lion. Their natural range is from South America to Canada. They vary in size, going up to 300 pounds, and in coloration, depending on where they are trying to camouflage themselves. They are excellent climbers, partly because of their long tail. They also can swim, going into water after their prey. Cougars live in the wild for eight to ten years and in captivity for sixteen to twenty years. Cougars can’t smell or see that well. We observed Tika having a problem trying to spot the meat that was thrown into her cage. We learned she is very shy and illusive and doesn’t seek contact with humans. Kelsey advised us what to do if you see one. You should make yourself as big as possible. Do not run as this triggers their instinct to chase. Make a lot of noise and keep eye contact. 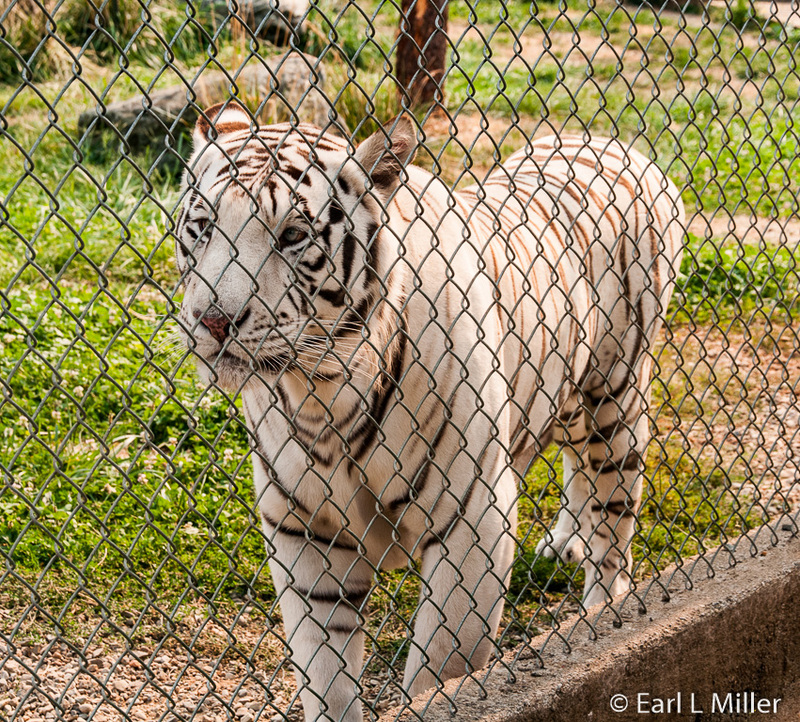 Brutus, Scooby’s younger brother, is a Royal White Bengal tiger. This cat, weighing 300 pounds, had his second birthday this year. Bengal tigers are about 90% developed by the age of two so he still has some growing to do. 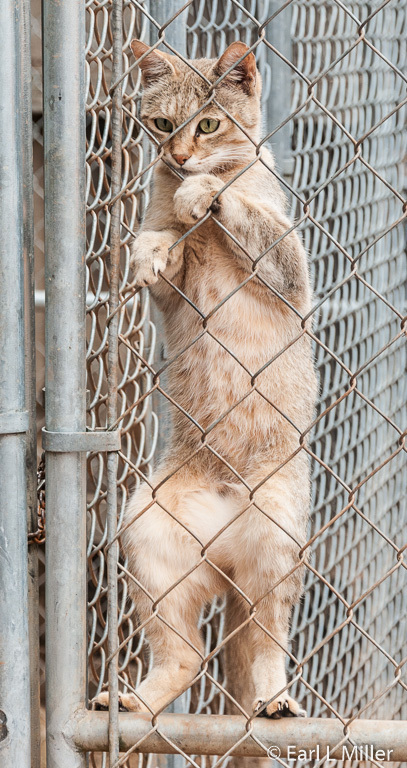 Like his brother, he stood up on his hind legs, with his massive paws against the fence. This allowed us to admire his size. We learned when tigers rub like this against the fence, they are actually applying their scent and marking their territory. Brutus was very friendly, wanting lots of attention from Kelsey. He and Scooby came from Goddard, Kansas’s Tanganyika Zoo. Brutus was about a month old when he arrived at Great Cats. 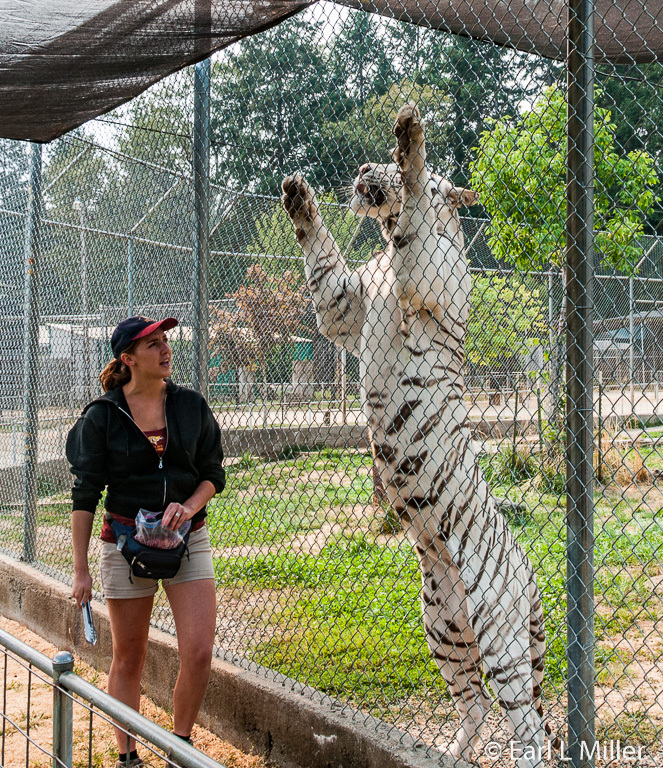 White Bengal tigers aren’t always successful hunters. They usually catch their prey about one out of twenty times. They usually eat once a week. We observed toys in every enclosure and learned bowling balls are the only tiger proof toys. Cats also love melons and pumpkins to play with then eat. Kelsey told us tigers love water. The park is working on building water features for them. 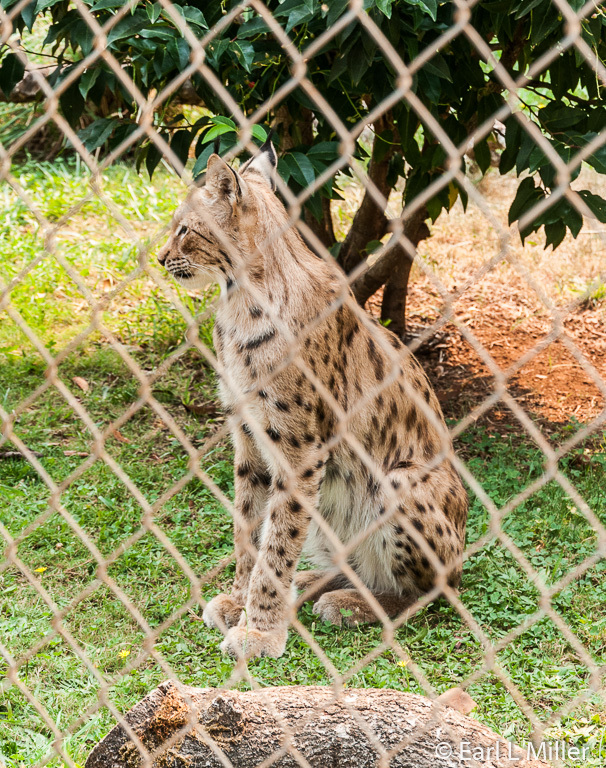 Stoli is an Eurasian lynx which came from the same zoo as the two tiger brothers. He just turned age two and, according to Kelsey, loves to play. Eurasian lynxes are medium-sized cats native to Scandinavia, Central and Eastern Europe, Siberia, Central Asia, and East Asia. They look like they were put together by people who couldn’t decide how this animal should look. It has hind legs like a deer, spots like a cheetah, ears like a fox, and a nose like a dog. They have ears and cheek ruffles and huge tufts of fur in between their toes. Besides that, they have a short stubby tail for balance. Eighty percent of them are gone from the wilds. They hunt animals that are low to the ground, like rabbits and frogs but are known to take down deer. Raina is a four-year-old Amur leopard. Unfortunately, they have not been able to find a breeding match for her. Kelsey had Raina show her teeth and grumble. She proved to be an excellent climber. That wasn’t surprising since Amur leopards can do that better than any of the other cats. Only 23 Amur leopards are left in the wild at the Amur River Valley of Siberia. The Russian government has established a no poaching order, but unfortunately there is an oil line running through the heart of their territory that is affecting their habitat. Sadly, it is estimated that they will be gone within 3-1/2 years. 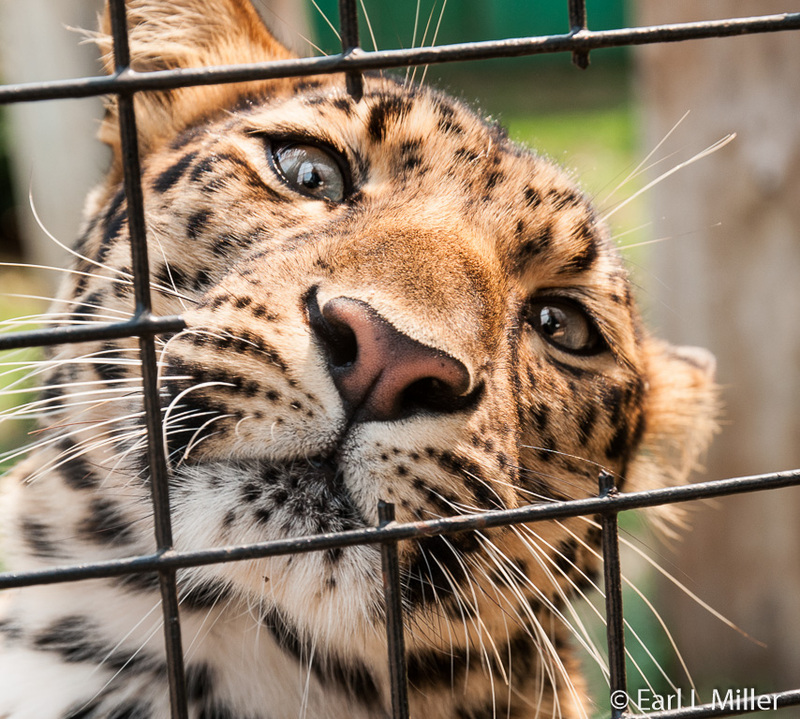 Only 180 are left in captivity throughout the world. Kelsey told us this species is expected to be extinct in less than 50 years. Their litters are one to six kittens with an average of two to four. Taboo is a Black leopard. Handlers have been known to leash Taboo and walk him around. Though black is part of their name that color is actually a recessive gene. They are more red or brown. They do have spots, but with the dark coloration, these patches are difficult to see. Leopards are elite athletes. They can take down a 300 to 400 pound animal and drag their kills into trees. They are regarded as the most dangerous of cats and among the smartest. In Africa, Black leopard kittens are born but don’t normally survive to adulthood. That is because they stand out in their environment, becoming food for predators. Ciro and Malenka are two servals. Earl was able to capture a photo of Ciro. They have come together for breeding and have had six successful litters. Their latest babies, three of them, were born this past July. These two love to play, tossing their toys back and forth. 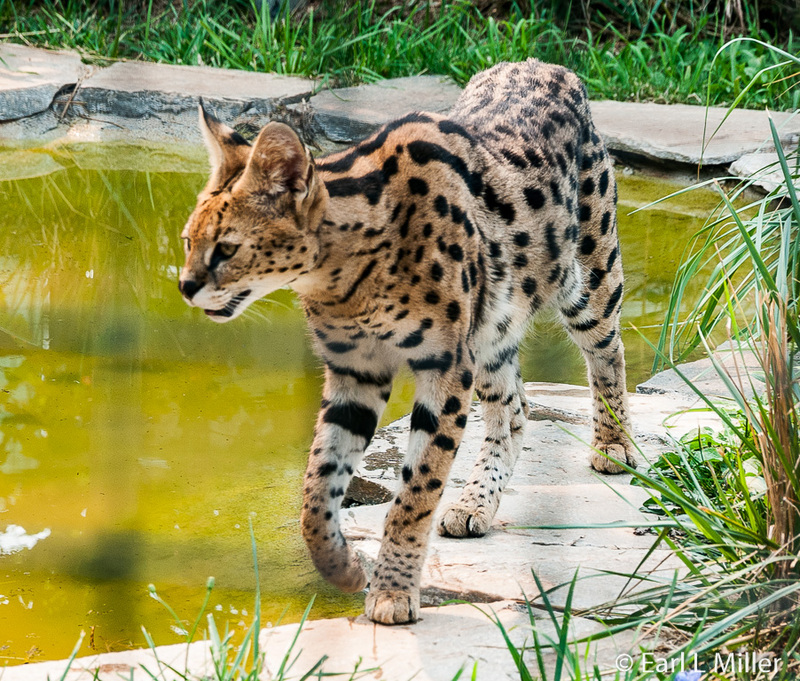 Servals are known for their excellent hearing. These cats have giant ears which rotate 180 degrees. Having the longest toes of all the cats, they can reach into rodent holes. They also go into shallow water for prey since they have no problems having wet paws. They’ve been clocked running on their long, skinny legs at 47 m.p.h., the second fastest to the Cheetah. Unfortunately for them, their fur is mistaken for that of Cheetahs so it is sought. This has resulted in their decline in number in the wild. Toby and ChiChi are Geoffroy Cats. Toby is an eight-year-old male while ChiChi is a thirteen-year-old female. Earl managed to capture a photo of ChiChi. While they are a breeding pair, they have never had a litter. These are smaller, more aggressive, cats from South America. Their babies are born in treetops weighing only 65 grams. At ten days old, their eyes open while at eight months they become independent. Geoffroy cats can take down a 20-pound monkey. Ali, a nine-year-old African wildcat, is ancestor to the house cat that was domesticated 4,000 years ago. Kabeer is Ali’s litter mate. This species is now endangered. They are known for their long, thick claws which are very fast. Kelsey had Kabeer demonstrate grabbing and it was easy to see how this species got its reputation for quickness. In 2003, in a New Orleans laboratory, Ditto and Magic, were the first African male and female wildcats cloned in a test tube. The two bred and Magic, now eleven years old, gave birth to Nyla (See photo). Kelsey told us Magic is the friendlier of the two and is leash trained. It is hoped that cloning can save a whole species of cats. 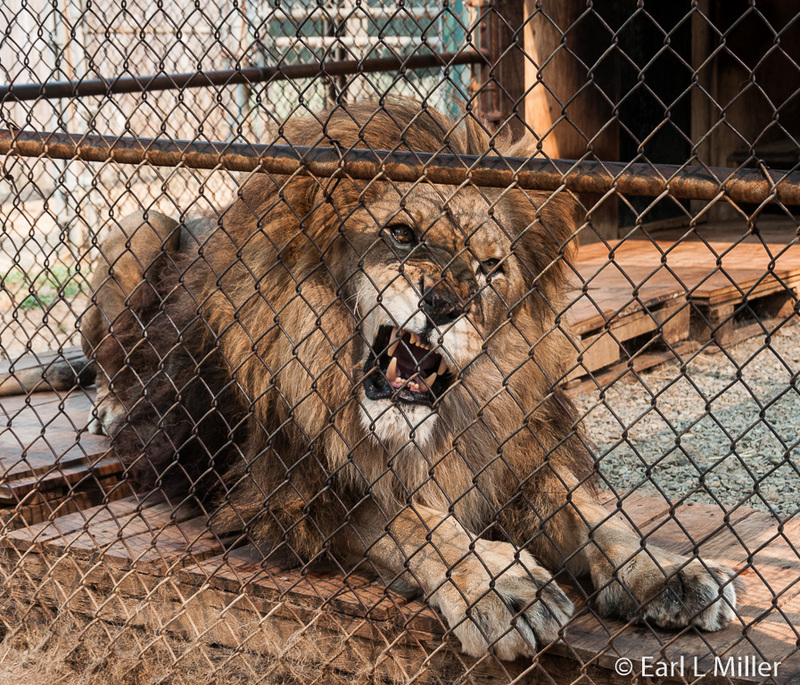 Shakka is an 18-year-old male African lion. He’s the only lion they have, though they are waiting for another to join him. They obtained Shakka for breeding, but he and the female didn’t get along. Kelsey had him roar several times, showing off his teeth. Lions have the biggest paws of all cats. Unlike house cats, male lions groom only their faces and paws as they want to maintain their smell. Their job is to defend their territory. Females do the hunting and raise the cubs on their own. The males eat first, then the females, and then, finally, the cubs. Only one in eight cubs survive to adulthood. 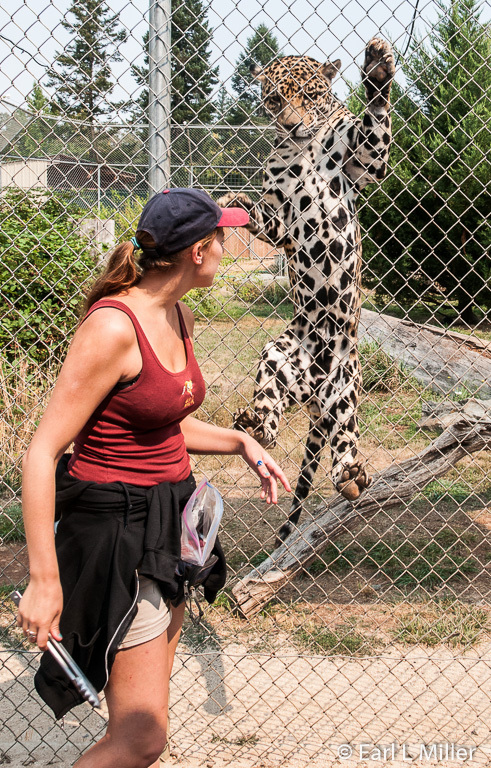 We learned that the veterinarians come to Great Cats when the large cats have problems. However, handlers transport the little cats to the vet in vans. We next saw Beowulf. 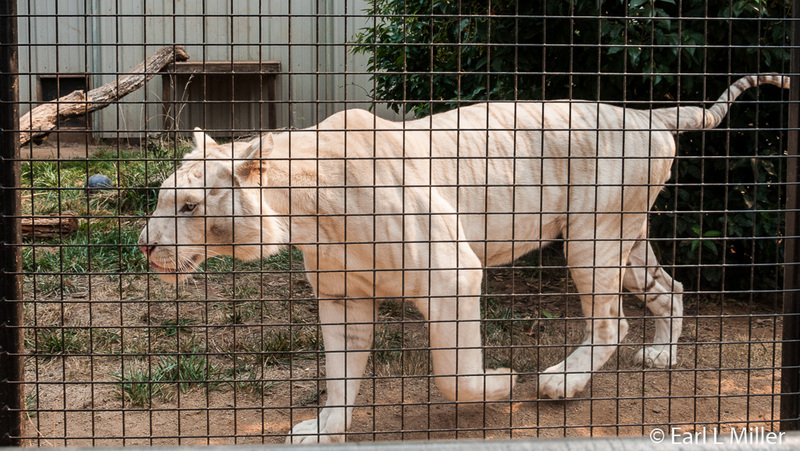 He was the first white tiger born at Great Cats World Park. Now, only a year old, he will be 500 pounds when he is fully grown. Handlers take him out on a leash daily. White tigers live in the wilds for six to eight years. They live with two to fifteen females and two to three males, with one male the Alpha cat. The cubs were really cute. Newborn cubs stay with the mother for two to three weeks then the park takes over their care, hand feeding them for eight to nine weeks. If the cubs remain too long with their mothers, they don’t develop a bond with humans. They are handled by keepers as long as their temperament allows. They’re all leashed and crate trained. 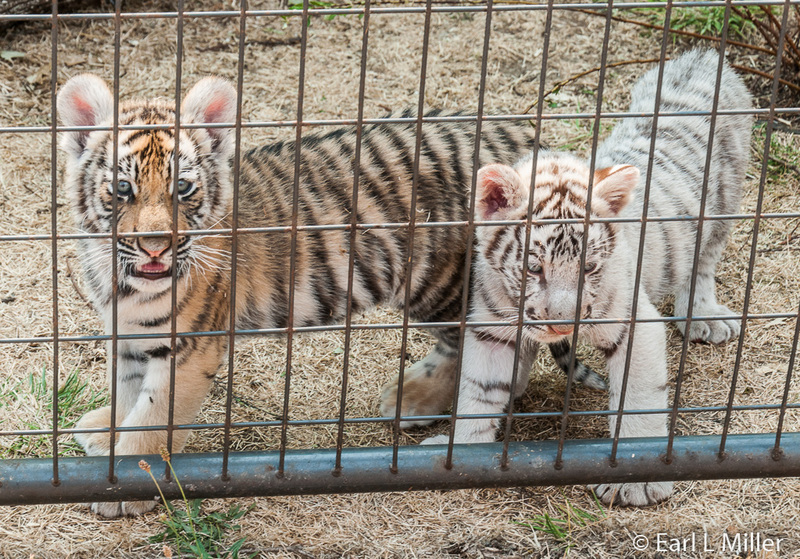 The park had a litter of two white tiger cubs and three orange cubs born within a week of each other in June. When we were there, we saw from these litters two white male tiger cubs and one orange female tiger cub. All could walk on a leash. It was all we could do to draw ourselves away from watching them. Malawi and Twister are African caracals. Twister walks on three legs as had bone cancer in his knee and had to have a leg amputated. He now has recovered and walks without any problems. According to Kelsey, he has two girlfriends. Malawi was introduced to Twister through a visual barrier. Kelsey had her hiss upon command. The closest relative to African caracals is the cougar. They are not related to the lynx though they were called Desert Lynx for a period of time. Caracals like to hide in tall grass and have the fastest paw speed of any cat. They can jump as high as 13 feet, 11 inches. The name “Caracal” comes from the Turkish word for black ear. These cats are surviving better than the other cats and aren’t even on the endangered list. Spunky and Bogie are two jaguar brothers. Both are 13 years old. The jaguars’ range is the whole southern half of the United States, Mexico, and South America. Wrapping their teeth around their prey, they crunch it in one bite. They hunt in water and will eat alligators and snapping turtles. 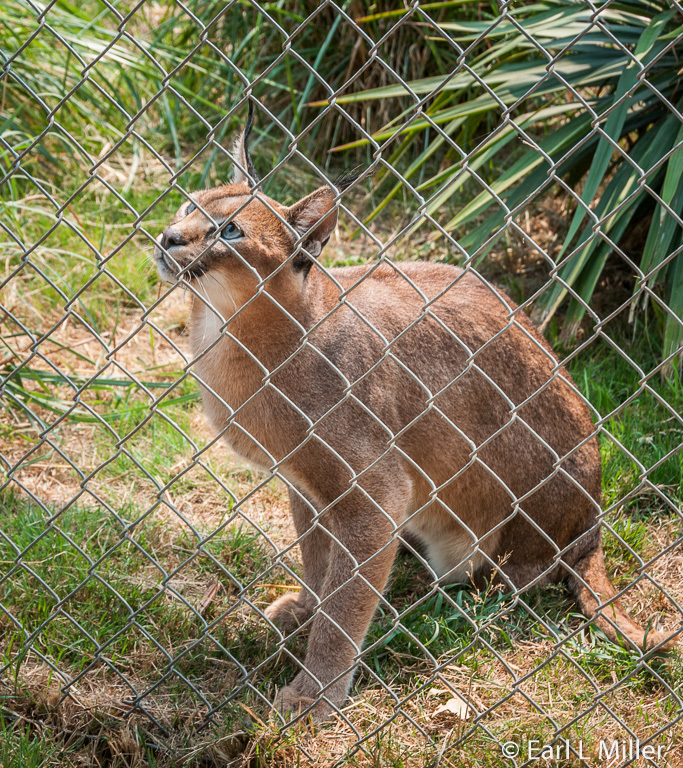 On land, they have been known to dine on smaller cats such as cougars. Human aren’t a challenge to jaguars. We learned cats roar or purr but not both. Among those who roar are the leopard, jaguar, lion, and tiger. Sampson is a 13-year-old Bengal tiger. He was recently a first time dad. Kelsey told us only Bengal tigers can be white. There were nine tiger species but three are totally extinct, the Balian, Javan, and Caspian. The South China species is no longer seen in the wild, but you can view them in captivity. Currently, only 2,500 tigers are left in the wild as 80% have been wiped out. It was fascinating seeing all the species of Great Cats. Next time we hope the fishing cats have returned from their travels so we can see their claws and web feet. Hours vary by season. From mid-March to Memorial Day, as well as September and October, hours are 11:00 a.m. to 4:00 p.m. daily. From Memorial Day weekend to Labor Day, the park is open daily from 10:00 a.m. to 6:00 p.m. In November and February, the park is open weekends only from 11:00 a.m. to 4:00 p.m. It’s closed in December and January and can be seen by appointment only. 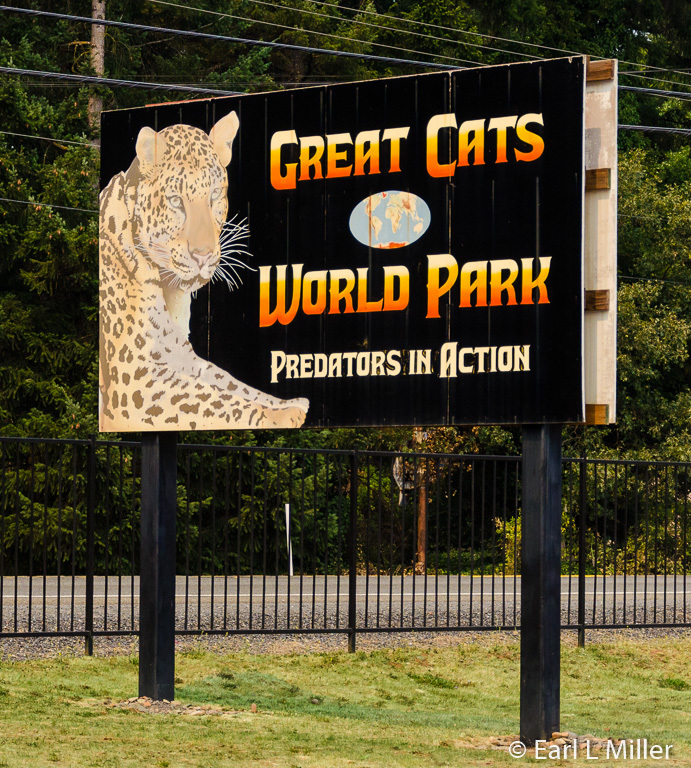 You’ll find Great Cats World Park at 27919 Redwood Highway, a mile south of Cave Junction. Their telephone number is (541) 592-2957. Admission is $13 for adults (ages 13+), $12 for seniors (65+), $10 for children ages 4-12, and free for those under age four. 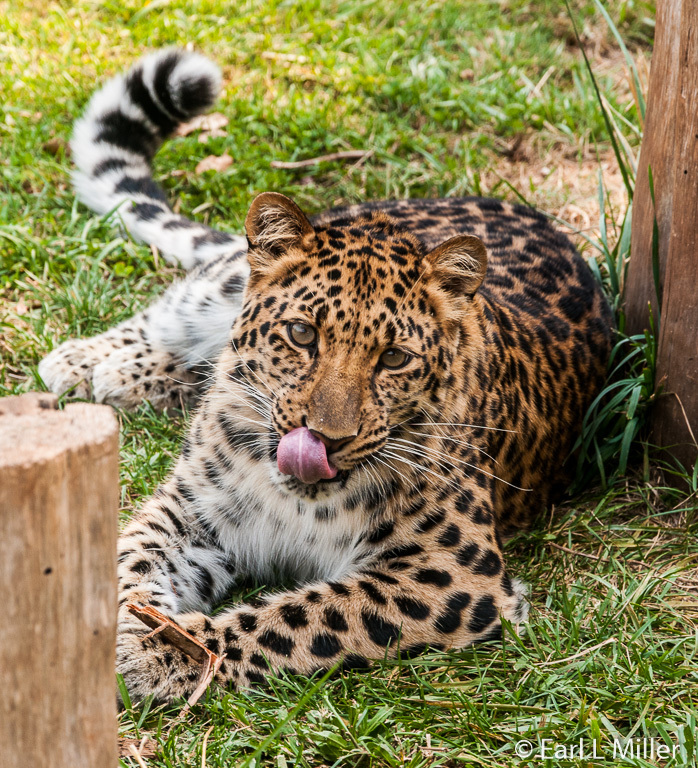 Meiki, an Amur Leopard, was the Most Photographed Cat. He is Still the Symbol. Is That All You are Going to Feed Me? I'll Show You That I Can Climb for It.